Discussion in 'Australian Lizards and Monitors' started by TheRamiRocketMan, Jan 21, 2019. I've had this baby Eastern Water Dragon (1 month old) for about a week now and he (might be a she, can't tell at this age) seems to be really settling in. He is active, eating, and exploring his massive setup. I constructed it to be suitable for an adult dragon, so it's 6' x 3'. For lighting I have a double dome basking spot with a 150W basking lamp and a 10.0 Compact UVB bulb creating a 33 C (91F) basking spot. I also have an LED full spectrum panel for UVA and visible light. Trouble is, the dragon doesn't seem to bask all that often and I'm worried he won't get the UVB needed for healthy growth. I could take him outside but I'm struggling to handle him and I'm worried that over-handling could hurt him or cause him to mistrust me. He also could escape. He is so small and difficult to keep track of. Any suggestions on how to get a baby water dragon to use his basking spot? How are you measuring the basking spot temperature ? How far from the basking spot is the 10.0 compact UVB globe ? Is it in a dome or small hood ? You wont get enough UVA or UVB even from a very strong 26W UVB200 in hood if it's more than 20cm from the basking spot. I think you should be aiming for about 180 microW UVB / sq.cm and 1 mW UVB / sq.cm at the basking spot. The inadequate UVA & UVB may be the reason OR the temperature measurement is inaccurate (and it's actually hotter there than you think). I'm measuring basking spot temperature with an infrared thermometer. I also put my hand on it and the light feels comfortably warm. The UVB globe is in a double dome with a 150 Watt Basking bulb. The dome is positioned such that the basking blub's light is only half on the rock and half on the substrate so the basking spot isn't getting the full power of the 150W. There is no mesh between. The packaging says that at 20cm distance UVA should be 360 microW / sq.cm and UVB should be 60 microW / sq.cm, I'm probably getting a bit less than that since I'm at 25cm. I chose the most powerful UV bulb at the store so does that mean the only way I could increase UV exposure is by lowering the dome? I want to avoid doing that because of how hot the basking spot is, plus I don't want my water dragon to try and climb the dome (since he is such a jumper ). As a little update I have seen him bask a little bit over the past few days, each time for about 15min. It is hard to say since he feels pretty exposed while basking and scampers away when I come to take a look. All I know is he basks significantly less than my adult bearded dragon who is always lying under her UVB bulb soaking in the rays. I don't think you will ever get enough UVA or UVB from a UVB150 globe (rated 5% UVB). the dome is already essentially doubling the UV at the basking spot by focusing all the globe's output in UV into a narrow beam. 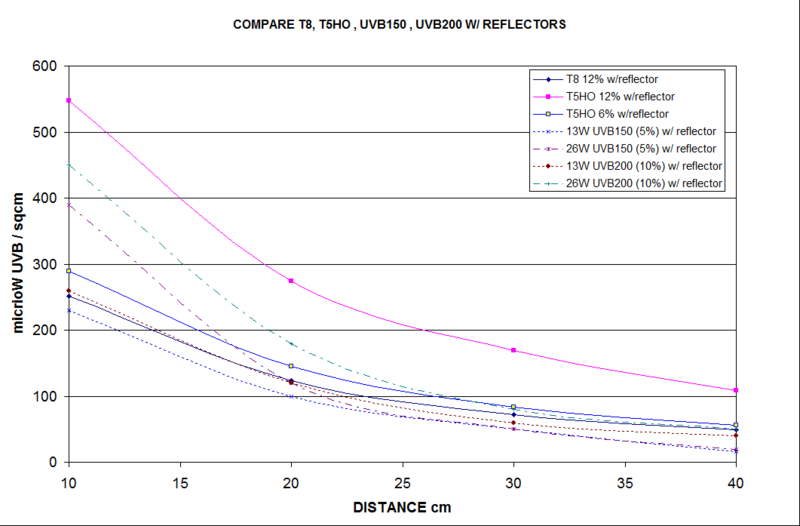 I'd swap out the 25W UVB150 for a 25W UVB200 , this will double the UVA & UVB at the same distance in the same dome and give serious consideration to converting to an Arcadia T5 12%UVB tube and suitable reflector hood. You can order these online via Ebay , or AmazingAmazon , or PetBarn , etc. When you measure : are you making sure that the basking spot actually fills the measuring spot and you are NOT measuring the reflection of the globe on the surface. If the thermometer has a spot of 1:12 , this means the measuring spot diameter is 1cm at 12cm from the surface. If you are measuring in a way that the gun sees the reflection of the globe , this will result in the high temperature readings. Are you able to adjust the emissivity of the thermometer ? If the gun's emissivity setting is wrong , this will result in either reading high or low temperatures. Hmm, looks like UVB200 is the way to go. I would go with a T5 12% (I use a tube in my bearded dragon setup) but the enclosure I'm using is so large that mounting it would be incredibly impractical. My thermometer does have a 1:12 spot. I'm measuring the temperature perpendicular to the basking spot so that the reading is essentially in shadow. I think I'm doing it right but I'm no expert. My thermometer has no emissivity or calibration settings on it so it could be dogey. Not sure if this is a valid test but I measured the ice-cubes in my freezer (set to -18 C) and they read -16.8 C. My palm reads 34.5 C. That sounds pretty accurate but maybe not? Get a descent mercury vapour lamp. I use the Exo-Terra Solar Glo lamps. I was going to go with a MVB for the longest time but I was persuaded not to by a local keeper who said that the MVBs UVB output is high but drops very quickly throughout the lifetime of the bulb. Since compacts are less expensive and last 12 months I went for them instead. Also I struggled to find a cage lamp that I could effectively hang from the ceiling. This, combined with the inability to dim them turned me off MVBs. For now I think I'm going to go with a UVB200, although a compelling argument may sway me to an MVB. MVB's last 24,000 hours plus with a UVB output almost for half that life. At a couple of hours a day you're not gonna need to worry. Those compact UVB fluoros are totally useless. I am still running some mvb's that are 4+ years old (they run on timers for only a couple of hours a day) on some turtle tanks. My turtles love the MVB lamps and have never had metabolic bone disease, soft shell or calcium deficiency syndrome. I daresay once you crank up a MVB lamp your beardie will bask freely. Your current lighting setup just most likely isn't warm enough, too warm or most likely just isn't putting out enough UVB to stimulate a basking response. My turtles that are kept indoors still breed and lay nice hard shelled eggs. This wouldn't be the case if they had a calcium deficiency due to crap UVB lighting. Ps. Take your temp reading on the basking spot with a laser thermometer gun... the most accurate way. These things cost like $12 and are worth their weight in gold, I must use mine 50 times a day. They use a standard rectangular 9v battery, the same ones old school smoke detectors use. Just point and pull the trigger for an instant temp reading. Ice's emissivity = 0.98 is very similar to skin (e=0.985). What are you using for a basking spot, the emissivity is easy to look up. If it's emissivity is different to the factory emissivity of the thermometer (usually set to e=0.95 on the units with no emissivity adjustment) it is easy to compensate for incorrect emissivity between the meter and the surface , but most don't bother , they simply live with the knowledge that their thermometer is likely in error by up to 10% depending on the emissivity error => if the temperature is 40 degC , the error is +/- 4 degC. This is why it pays to tape a probe style digital thermometer to the surface and to check against it's temperature.